Made by Hand- the great Sartorial Debate: Indochino- How did my garment turn out? OK let’s get to it. This is going to be a long one. And while most of this is specific to my experience with Indochino, a lot of the pointers could apply to any kind of MTM experience so may be worth a read to anybody who is thinking about getting a suit made. I’ll address some of the construction details in another post. There have been a number of questions and comments here and elsewhere that I will try to address, but if I miss something, please let me know in the comments section. First, I want to address expectations. Several people have said that they like what I make for myself better. Well, duh. If what I make for myself is not a million times better than an inexpensive MTM garment I should immediately quit what I am doing and become an accountant instead. You can’t compare a hand-made bespoke garment with MTM. If you have spent any amount of time browsing the online clothing fora, you should probably know by now that even bespoke clothing, being the result of expert craftsmanship and several fittings, which by all accounts should be the pinnacle of perfection in fit, is still subject to imperfections. I can count on one hand the number of online posters who own what I consider to be impeccably-fitting garments, and 99 times out of 100 (or more) they are the result of an ongoing collaboration between client and cutter. The first attempt is almost never even close to perfect- any true customer of bespoke clothing will tell you this. So I think people need to moderate their expectations when it comes to made-to-measure clothing, especially in the first attempt, and most particularly with less conventional formats such as this one. This is not to excuse egregious errors which may occur, but to put a little perspective on things. Generally, however, people seem to agree that Indochino did pretty well on this suit, compared to some of the other examples floating around the internet, and questions have arisen to why this may be. I certainly didn’t give them much guidance. So what made the difference? Well, first off, I am not a believer in making clothing from measurements alone. Three people with the exact same chest circumference can be shaped completely differently- the very erect guy with flat back and prominent chest, the stooped old man with a dowager’s hump and flat chest, and your average Joe. How on earth is a chest circumference supposed to capture this? Then there is the matter of personal preference. To the client’s skin measurement we always add what is known as “wearing ease”. This is not a compression tshirt, it is a suit- it must be bigger than your own measurement to some degree. And it is the degree which trips people up. Standard ease would be between four and six inches more than the body measurement- for example, if your chest measures 40”, the coat chest should generally be between 44” and 46”, depending on how you like to wear your clothes. One guy will find 4” too big, however, and the next will find it much too tight. How do you account for this? When I was fitted, my measurements indicated two possible sizes to try on. I tried on three. This is probably the most important part of any MTM process- find the garment that is closest to a good fit, especially in the shoulders, and work from there. And this, kids, is the moment where you need to step up and pay attention. This is the point where you need to communicate to your fitter if the length, the button stance, the general fullness, everything is right for you. If not, now is your chance to say so; your fitter is not a mind-reader. Is the sleeve a bit too snug? Is it perfect? Is it too big? Say so now. Have the fitter explain exactly what changes they intend to make to the garment you currently have on. They may think the waist needs to be cinched a bit, but you feel that it’s fine. Say so. That being said, how does one manage when one does not have access to a trunk show and you have no option other than to submit measurements online? The remake policy is probably the best (only?) way around this. Self-measuring is a crap-shoot at best, but with a good alterations and remake policy it takes much of the risk out. My one caveat is that customers should not try to micro-manage the remakes. A lot of what I see going on online makes me cringe, when the customer tries to get too specific or too technical. Send them pictures and explain generally what you don’t like- “the shoulders are too wide”, for example. What you interpret to be too much padding may have nothing at all to do with padding so if you ask them to remove padding with the expectation that the expression will change, you will fail. If, given your general description of the issues and some good photos (dump the iPhone, please) the technicians at the factory can’t figure out what needs to be done from that, then you telling them to “reshape the sleeve head and crown to fit the armhole” is certainly not going to get you anything except possibly frustrated, especially since the Chinese-speaking technicians may have no idea what the internet-fueled jargon you may be using actually means. Unless you are a trained garment technician, or you play one on the internet, do not try to get overly technical. Another element which may have contributed to the success of my garment was that I had one of their in-house fitters who flew in from Vancouver- many of the others are hired temps which get a few hours of training in fitting. Some have more experience than others, which may suit the general population who doesn’t know better, but if you are reading this blog then you are probably more attuned to fit and should be working with one of their more experienced people. 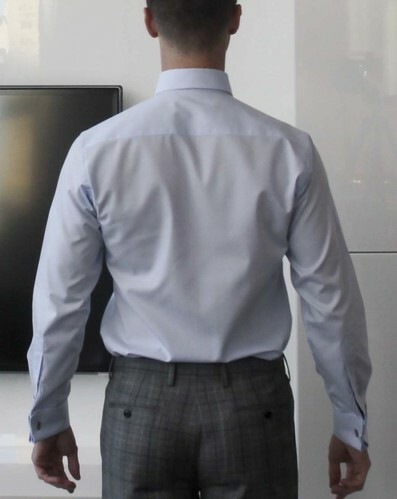 I found my fitter’s story compelling- he was initially a customer of Indochino who was so impressed by the experience that he went to work for them. That says a lot about his level of enthusiasm and interest which probably went a long way toward making my garment a success. 1) Look on my new bespoke Rubinacci, ye small-timers, and despair! 2) ZOMG look at the new Kiton jacket I just scored on ebay!!1!! It’s very likely that Indochino has a lot of satisfied customers who can’t be bothered to post photos of themselves on the internet, I and if the success rate of a company could be judged based solely on what we see posted on the clothing fora, Anderson and Sheppard would have gone out of business a very long time ago. Now on to the nitty-gritty. The shirt is not bad for a first attempt, but considering their emphasis on fitted clothing, I find the back especially blousy. Darts would go a long way to contouring the fit and should probably be added as a matter of course (Heikal, are you reading this?). The collar and sleeve length are correct, and those are probably the most critical points. My only gripe about the styling of the trouser is that I would prefer a narrower bottom with such a narrow knee- this borders on looking flared, and I would also shorten a trouser this narrow- there should really be almost no break at all, if any. It’s pretty typical that the back hits the calf when you taper so aggressively to the knee, though in general they could pick this up a bit. The fit of the seat is very good, though I gave them some help. I have what we call a “prominent seat”; the default for most trousers is to have one dart above each pocket and there is no way that a trouser will fit my seat with only one- two are required. They add a second in certain instances (it was not entirely clear when- it seemed like only the large sizes got them) but I insisted that a second would be necessary in my case. They said they would try, and they did. The pockets sit flat and do not gape; there is a bit of pulling in the thigh but that is pretty typical of a trouser that is so close-fitting in the thigh. 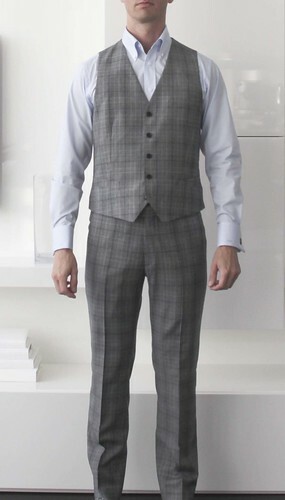 Customers are advised to pay particular attention to the fit of the trouser during the fitting as they are quite slim. The vest seems blocky, but I haven’t cinched the belt, which would help. I did it on purpose because the majority of vests on the market have loose, blousy backs which really need to be cinched a lot, and I hate that. 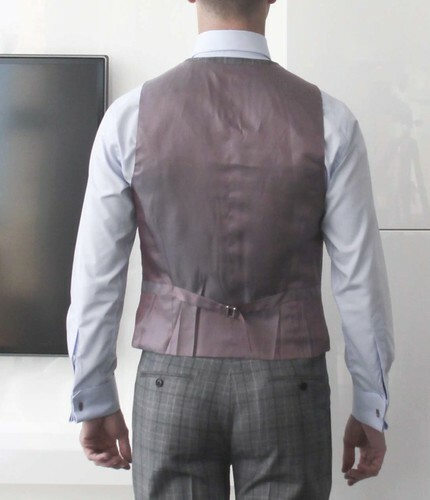 The back of this vest is actually very well done, quibbles about the position of the neckline aside; it could also be a bit closer to the body, but then I would not have room to eat. If it were a bit longer and the points more elongated than horizontal, it would look a lot slimmer than it currently does, but would be too long in proportion to the jacket. I may ask Foo to work his magic on the picture so you can see what I mean. But in general, a better –than-average fit. Several people have commented about the length of the jacket being too short, stance too high and lapels too narrow. Were this a classically-styled garment they would have a point, but this is not. It’s a fashion-forward garment. I tried on some Isaia DBs in Milan and the hem of the jacket was about even with the hem of the sleeve, so if one is to judge by what’s going on in the market, it’s maybe even a tiny bit too long. I think that’s getting into dangerous territory for a DB and think that the details of this garment, for what they are trying to achieve, are actually correct. The fit of the shoulders is good, however I don’t think that they are set up to capture low shoulders- in any case, they seemed to have missed mine. I would have sloped them a bit more as well. Other than that, the fit of the front is quite good, and I like the sleeve length. The back is pretty good, with two exceptions. They need to work on their sleeve pattern (to be fair, the back of the sleeve is the Achilles heel for most clothing pattern designers) and the seat of the coat is much too small, causing the vents to gape badly. This also seems to be a recurring theme so they may want to look at their base patterns. On the subject of sleeves, they didn’t match the plaid on the front. This is a must, in my books, though certain Savile Row cutters wouldn’t agree- I have seen a lot of SR garments which weren’t matched either. I’d be willing to give them a freebie lesson on matching plaids if this is anything other than a mistake on their part (Heikal?). So on the whole, I consider this experiment fairly successful; other people have had different results, though. If you’re in the San Francisco area and want to have a look, or even try it out for yourself, the Traveling Tailor is there this week, from the 18th to the 23rd. It’s worth a look just to see their setup. You can book an appointment here. Thanks for the very detailed fit analysis. It's certainly well done for mtm. 1. Any tips on how to get one of the more experienced tailors and not a hired temp? 2. What's your view on the fabric quality? The website says all suits are 50% canvassed...what's your view on the quality compared to, say, an off the rack Ralph Lauren Black Label (considering getting one of those...) Or as another comparison, is Indochino better than a fused Boss, for example? Could you explain your comment about the slope and shoulders? To my eye, it looks good. So must be an expertise thing. How would you have improved it and how would it have looked different, even if subtle? Thanks for this informative, thoughtful post. "Now the jacket hips. You are carrying a bit of a caboose there it should be said. They should have added a couple of inches to the jacket hips but clearly haven't." I'm afraid any maker of MTM would be between a rock and a hard place on this matter. Had they added 1" per side to the hips, the waist would have become wider as well. And I know so many customers who would rather complain about the loose waist than the tight hips/ gaping vents. 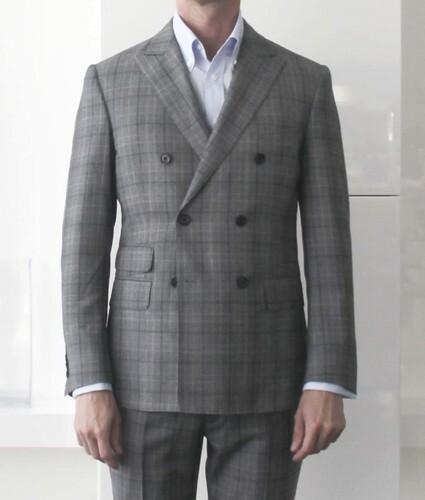 After all, this is the first attempt, it's MTM and we all have seen pictures of suit # 2,3 or many more from highly praised full bespoke tailoring houses which, fit wise, haven't improved much and often look much worse than optimized MTM. BTW, I'd like to see the second suit from Indochino made for Jeffery. What was the fabric like? What was the quality of wool used? It's clear that there is a drafting problem with the sleeve in back. How would you change the draft to fit better? This wrinkling is very common in jackets for both men and women. 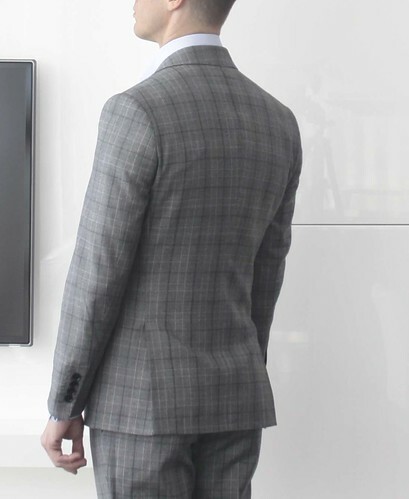 Rearding the suit length, how does this jacket compare with one of your own making? I realize this is a "fashion forward style" so how much shorter proportionately are they going compared to a classic length? would you be doing a review on make and material? would be intresting to see what they could do in that price range. Same as Jimmy. How's the material feel? Wow super suit. Really I like all suit and picture . .Thanks for sharing this post . Funny how everyone has an idea of how it could be done better. I get the impression that Jeffery is pretty happy with the fit. Looks excellent to me! 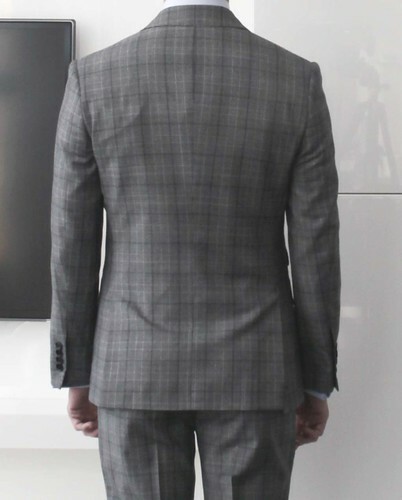 Wow this is the best example of quality custom suit with excellent fit with rich fabric. I really love the way this suit has been designed and fitted. Great post and Indochino did well on this suit. I like that you captured the fact that measurements alone cannot make a great fit suit but body proportions must be taken into account as well. You should give a new company i found called IKETUONYE a try. www.iketuonye.com They have a very unusual way of taking measurements via their website, they allow you to select from different body types in addition to giving your measurements. Thanks a bunch for this article it was well written and you looked great in your suit. Jeff, thanks for this article. It's helped me figure out why some pants fit better than others for me. I seem to have the prominent seat issue (asset) as well. I finally noticed the pants that fit well have this. I also recently got an order delivered by Indochino and my jacket as fine, but I realized after the fact they only gave me a single dart at the back as well. Now I am requesting a double seat darts, and it seems their customer service reps are not sure what to make of it and if they can accommodate. I sent them pics of the fit issue and hopefully their tailor realize that double darts are the best way to fix my fit issue.